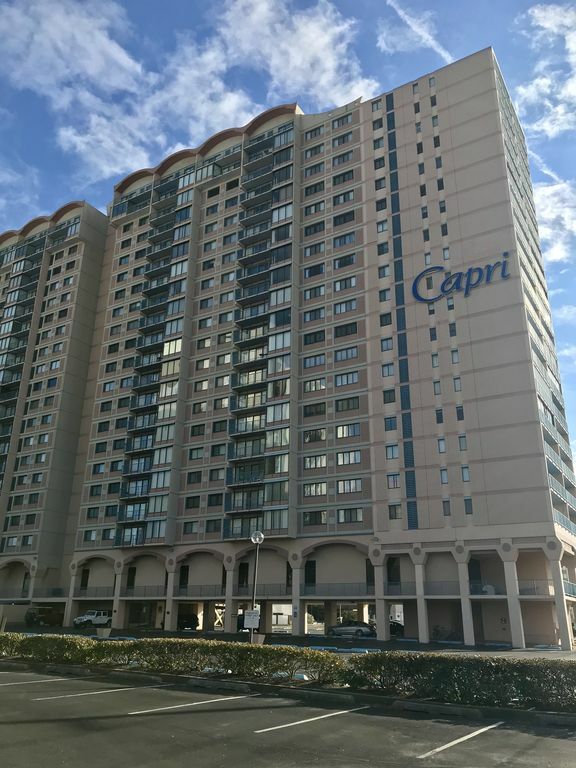 The Capri is an Ocean Front building. You and your children and guests can walk directly to the beach from the building. Enjoy beautiful sunrises and sunsets. Our condo is located on the 15th floor and it has 2 bedrooms and 2 full bathrooms. The master bedroom has a king size bed, the other bedroom has 2 twin beds, and 1 queen sleep sofa in the living room. A 50-gallon water heater avoids cold showers. Kitchen was remodeled in 2010 to include Silestone countertops. Bathrooms were updated in December 2015 with tile shower and tile around tub. The unit is equipped with a washer, dryer, dishwasher, 3 TVs and a DVD player. The Unit has cable TV and free HBO and free private WiFi. Condo Association rules prohibit leases with individuals under the age of 25 and that individual must occupy the condo for the period of the lease. Occupancy is limited to 6 people, including children. Smoking and pets are not allowed. There is 1 assigned parking space. There is a municipal lot within walking distance for additional parking. Guests should bring paper products, linens and towels, beach equipment, and personal items. Each of the beds has pillows and comforters. There is a storage locker for beach equipment because beach equipment is not allowed on the elevators. Doorways will allow movement throughout condo except for entrance into bathrooms. Condo was very clean. Awesome view of the ocean and bay. Kids love the beach and the indoor pool. Will definitely stay again. Owner responded quick to inquiries. NICE accommodations!! Look no further!! This was my first experience with a place booked via VRBO. What a pleasant surprise! Being a full size 2 bedroom condo its so much more spacious than a hotel room. It has a nice size kitchen with new appliances and fully stocked cookware and utensils. There were 3 TVs and complementary wi-fi. The condo is spotlessly clean and Mary Jean is an accommodating and responsive hostess. There is an indoor pool, exercise room with several machines, universal gym and free weights. a game room, library, sauna and indoor basketball. Conveniently right on the beach and across street from Gold Coast mall. My family really enjoyed staying here and hope to return in the future! My favorite vacation home!!! The condo is very warm and welcoming along with having great access to the beach along with a beautiful view from the balcony. Mary Jean is always so helpful with questions and making it easy to book. I’m looking forward staying again to next summer! Amazing everyone should try to stay here if you want nice and luxury this is it. A few things I didn't like was you couldn't take tradh out after 10pm pool and sauna closed at 10 and some days 6. With a little one some days I couldn't get down there until later. The condo was a little smaller then in the pics .my recommendation would be do things early like beach and swim and sauna if u choose to also game room and exercise area better in the morning. We had great memorial holiday weekend stay. Mary Jane is so responsive and very easy to work with. The unit is very clean, the kitchen is very well stocked with everything you need. We really enjoyed our time and will definitely come back. We saw fireworks from the balcony. Mom is 88 years young and it worked well for her. Close to the elevator. Beds nice. Kitchen good. Loved the mirror wall that reflects the beach and can see the bay. Nightly Rate: $200 - $350 Weekly Rate: $1375 - $2400 Monthly Rate: $0 - $0 Time to start thinking about your summer vacation. Book your dates now so you can vacation when you want. Our condo has 2 bedrooms and 2 baths with panoramic views of the ocean and bay (See our pictures). Occupancy of the condo is limited to 6 people, including children. No smoking and no pets. When booking our condo, please send me your home address and cell phone number to put on the rental agreement. When this info is received, a completed rental agreement will be sent to you. We also require a completely refundable $250 security deposit 30 days before start of vacation. This is sent directly to me and will be returned to you following an inspection of the condo after you move out.